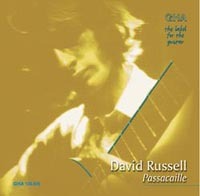 Landmark David Russell recording featuring the George Friedrich Haendel Suite No. 7, Johann Sebastian Bach Suite BWV 1034, and the Domenico Scarlatti Sonata K 177. Recorded by John Taylor at St Johns Church, London, 1989.